Tucked away for privacy, relaxation, fishing or hiking. Perfect for a family vacation. 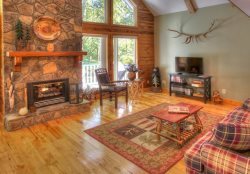 Elegantly rustic 3 bedroom luxury vacation cabin located in Alpine Helen GA! Conveniently located close to shopping and dining, but tucked away just enough to provide you with rest and relaxation after a day of fun, fishing, or hiking! 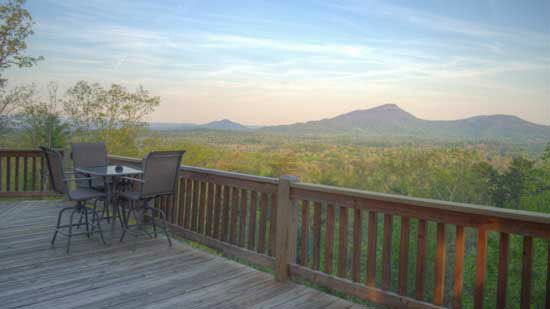 This vacation cabin near Helen is perfect for families, allowing everyone to have their own space! The main floor offers a master king bedroom with full private bath, kitchen, open living room with dining area, and access to upper level covered deck, perfect for enjoying dinner or relaxing and listening to the sounds of nature. The upper level offers a sitting area, bedroom with queen bed and full private bath. The lower level offers a large bedroom with 2 queen beds with an adjoining full private bath. The recreation room has pool table, flat screen TV, kitchenette, 1/2 bath and access to the lower level covered deck and outdoor hot tub. Our hot tub is professionally maintained and will always be fresh and clean upon your arrival! Fishermen in the family? You will be delighted to know that you will be close to several of the areas best fishing spots! Smithgall Woods offers fishing in Dukes Creek which is rated one of the Country's Top Ten Trout streams!! The Chattahoochee River also provides a great fishing experience and is stocked weekly. Lake Burton is a 20 minute, beautiful drive away. Hunting on your list of things to do? Chattahoochee National Forrest and Wildlife Management Area is located on the other side of Helen. Several other Wildlife Management Areas are close by as well, including Swallow Creek, Smithgall Woods, and Chestatee WMA's. Chattahoochee Trail is within the city limits of Helen, and walkable for those who enjoy doing so. There is ample public parking where you can enjoy an array of restaurants, shopping, tubing on the river, or the water park for a day of fun. Play a round of golf. Or just stay in and relax in the hot tub or play a game of pool. Wireless internet service is now available at Chattahoochee Trail. • Click here to view additional in-town cabins, all within 2 miles of Chattahoochee Trail! • Paved roads and driveway, accommodates up to 3 vehicles. Everyone was super helpful and extremely friendly. I cannot wait to return to Chattahoochee Trail and live the moment all over again where I proposed. I booked the reservation on line, but had to call several times. Ashley was very helpful each time, and was very knowledgeable about the property. Had a wonderful time. Will visit again. This place was WONDERFUL! It was very clean and spacious. It was in very close proximity to the restaurants and shops of Helen. We loved this cabin which was close to town but felt private and isolated. It was beautiful and super clean. We loved the decks looking out into the woods. It was the perfect low key family get away. I should note there isn't any wifi but we were fine with that as we took the vacation as a time to unplug. I'd highly recommend this place. The cabin was great, it was located close to the village and very clean. Great cabin for relaxing. Close to town but feels like your in the woods. Every person I interacted with was very cordial and helpful. The check in and out was a breeze. Enjoyed our cabin very much. It was an attractive, nicely furnished cabin which was very clean. The team at Pinnacle was very responsive and friendly! We had a wonderful weekend and loved the cabin! It's nicely furnished, clean and spacious. We really enjoyed playing pool in the game room. Can't wait to return! Great cabin. I will be coming back in the future! The property was very nice and family friendly. Very friendly and responsive. Easy rental experience. Gorgeous cabin and lots of room. Pool table and hot tub were fun additions which made our weekend getaway even more fun! We are working on our plans for next year! Great cabin wonderful amenities everything worked perfectly. Overall it was a great trip and stay. Everyone was very nice and it was so easy to work with y'all..
We loved this property and would stay again for sure. Plenty of room for everyone and even nicer in person then on the web. We were visited by the local "bear" who peaked in on our pool game like he wanted to play...(or eat us, not sure which but he stayed around for a few then went along..lol) Bedrooms were awesome and spaceous and the porch was HUGE...easy to find and so convenient to town. I made several calls to your office to ask a variety of questions, each time I called each question was answered to my satisfaction. I was given lots of ideas and general information about the area. Everyone was so helpful and gracious. We enjoyed both locations, they met our needs and both were lovely in different ways. We hope to return as a family next year for another family reunion.